Hi all! I had a JAM PACKED weekend, filled with the funnest of activities, and I've been anxious to fill you all in! Let's settle in with our beverages. The weekend began with a Twitter meetup, but we also had a dance performance in there and a Father's Day with that was busy enough to exhaust the children for the duration of the summer. ;-) Soooo, what I think I'll do is talk about my SUPER FANTASTIC Tweetup on Saturday afternoon, then save the dance hafla for either a separate post or episode of Tea Time. What do you think? Do you prefer the dance frivolity in post form or podcast? I want your input, so do write in. All right, so the Tweetup! You all know how much I love and value our Catholic community on Twitter. I find it incredibly supportive and soothing. And through the years, I have had the privilege of meeting some of my Twitter friends in real life. It's not as often as I like, but when it happens it really packs a punch. Some years ago, I became Twitter friends with a very nice fellow named Mike Gannon. We shared other common Twitter friends, as well as a Catholic podcast we both loved called This Catholic Life. 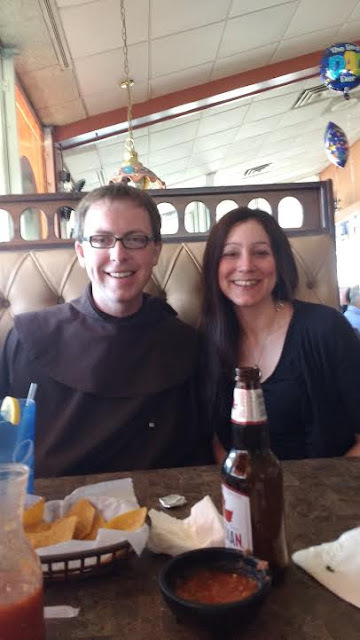 I knew that Mike was potentially interested in the religious life, and had a deep love of the Carmelites, so it wasn't a huge surprise in the fall of 2014 when he joined a community of Carmelite brothers as a Postulant. We missed him quite a bit when he was off of social media for the duration of his postulancy, but he happily has been back since he became a Novice. Several months back, Mike (who is now Brother Joseph!) let me know that he'd be in my area visiting some family during his vacation time. Naturally, I leapt at the chance to meet him in person! And so Saturday afternoon, Henry and I traveled to a local Mexican restaurant to meet up with Brother Joseph. Mike (my husband that is, this is terribly confusing with all these Mikes, isn't it?!) offered to entertain the kids elsewhere so that I could eat lunch uninterrupted, and let's face it, that's a TEMPTING offer. You mean, I can eat lunch without someone crawling around under the table in search of lost crayons, and Anne telling Henry to "STOP IT!!!!" on constant repeat for 60 straight minutes? What I ended up doing was having Mike take Anne for a Daddy/daughter date, and I brought Henry with me solo. I figured: when else am I going to get a free, up close and personal, advertisement for the religious life? So I asked Henry if he wanted to come, and he asked what kind of food the restaurant served. That shows you where Henry's mind is at in terms of this process, but no matter. He wanted to come, and that was good enough for me. ALL the excitement!! How cool do you feel when your friends wear habits?!?! I think that anytime you meet someone in real life whom you have only ever communicated with on social media, you're curious as to what they will be like. Will they be exactly as you picture in your mind? Or will they be completely different? Brother Joseph was exactly as I pictured. :) We had a lovely, easily flowing conversation, and enjoyed good Mexican food and beer. We talked about religious life like there was no tomorrow, and Henry asked some thoughtful and interesting questions. It was smashing. Anew, I felt intense gratitude for the gift of friendships that God has given me. Some of our Twitter friends I may never meet in this life, yet I know that if I ask for their prayers they will give them to me in a heartbeat, and that if I need some levity in my day all I have to do is log on and check my timeline. Glorious, I tell you, glorious! It is such a rush to meet social media friends in person for the first time. And we may get another opportunity next fall! Craft beer will be involved, for sure and for certain. Let's get reading for June!